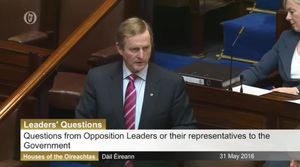 On RTÉ Radio One’s Marian Finucane show. The chair of Nama’s audit committee Brian McEnery gave a one-to-one phone interview with Ms Finucane while her panel was in the studio, in light of the recent C&AG report into Nama’s Project Eagle sale. Ms Finucane explained, before the 25-minute interview began, that the accountant, who was in London, did not wish to be a part of the panel discussion. Ms Finucane didn’t mention that Mr McEnery was a member of Nama’s Northern Ireland Advisory Committee, of which Frank Cushnahan and Ronnie Hanna were members. She also didn’t mention that Mr McEnery was director of elections for Fine Gael’s Michael Noonan, now Minister for Finance, before the general election in 2011. Mr McEnery was first appointed to Nama on December 22, 2009, for a four-year term, by the late former Minister for Finance Brian Lenihan, while he was re-appointed for a five-year term on December 22, 2013. The Northern Ireland Advisory Committee was established on January 7, 2010 and dissolved in September 2014, after the sale of Project Eagle. In 2013, the then Minister for Health James Reilly appointed Mr McEnery as chairman of the Health Information and Quality Authority (HIQA). Mr McEnery was also on the board of directors for Limerick City of Culture board in 2014. McEnery was a partner at Horwath Bastow Charleton, which, according to its website, ‘can support businesses in preparing business plans and in dealing with Nama and their other bankers’. 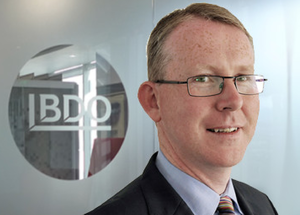 In April 2012, he joined BDO Ireland as a partner. The firm examined developer business plans on behalf of Nama and is on the state agency’s panel of receivers. 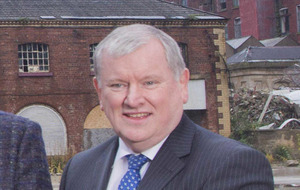 in June 2011, McEnery’s new employer was appointed as a receiver to developer David Daly’s Irish and UK assets. 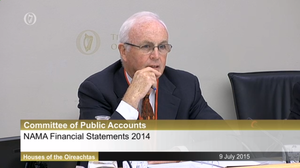 Daly owed €457million and was one of Nama’s biggest clients. BDO was also a close adviser to one of Nama’s top ten clients, Dundrum Shopping Centre developer Joe O’Reilly. Turlough Flynn, who works at O’Reilly’s Crossridge Investments, was listed as a guest of BDO at the Chamber of Commerce dinner in the Four Seasons in February 2012. Nama chairman Frank Daly was the keynote speaker that night. Nama’s board is in receipt of commercially sensitive information, the kind of stuff that clients of a firm like BDO would kill for. Having the inside track on an organisation as secretive as Nama would be hugely valuable for dealmakers trying to buy assets from Nama or even for negotiations with clients. McEnery will need all of his wits to avoid all the potential conflicts of interest that his new career move has brought. McEnery: “Well, Marian, and I listen to your, I listen to your programme every Saturday and Sunday. McEnery: “Ah well, yeah. Let me. So. I believe, and I’m going to try and go through the, go down through one or two points as to why I believe, as an experienced auditor, I’m president of our accounting body and I’m going to try and tell you why I believe he’s wrong. Firstly, I do agree with somebody who said if the C&AG is right, Nama is wrong. 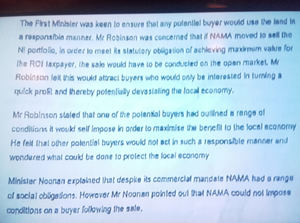 And for Nama to be right, the C&AG has to be wrong. And I think he is wrong and I’ll tell you why. Firstly, I think it was [former Labour leader] Pat Rabbitte said, earlier on, the discount factor of 5.5%. It’s as if they’re the prima facies in the whole of Ireland, the United Kingdom and Europe to use a discount factor of 5.5% – it’s ridiculous. 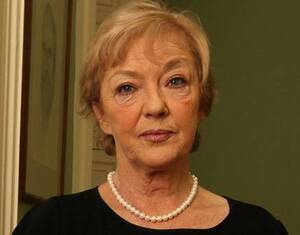 Posted in Misc and tagged Brian McEnery, Marian Finucane, Nama, Project Eagle at 11:03 am on September 19, 2016 by Broadsheet. Any chance of BS doing one of those in depth timeline pieces on this, including when the different bidders came and went? That’d be nice… much work in that I’m sure.